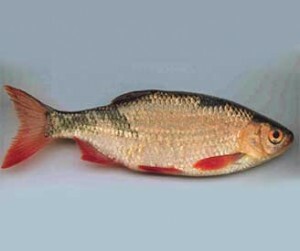 Similar to golden shiner; dark grey back, silver sides, blood red fins (shiner fins are yellow); up to 14 in. ; forked tail. Found in lakes, rivers, marshland and ponds with little current and prefer large weed beds; usually fresh-water but can acclimate to brackish conditions. Native to Eurasia. Identified in Harlan, Enders, McConaughy, Calamus, Sherman, Box Butte and Johnson Reservoirs (and likely others). Personal aquarium dumping, escape from aquaculture pens, bait bucket release, ship ballast water, and other activities. Outcompete native fishes for food, can also feed on vegetation, tolerates eutrophic or polluted waters. 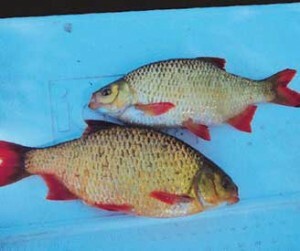 Can hybridize with native golden shiner.